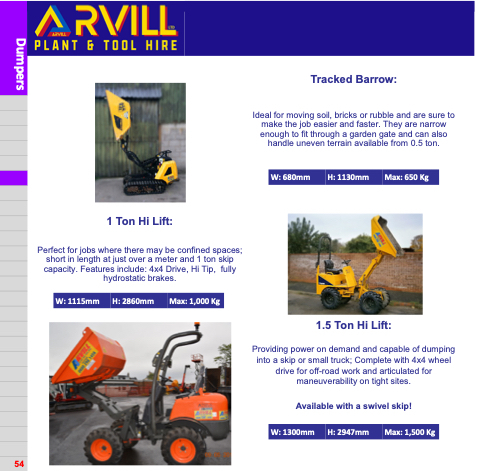 Ideal for moving soil, bricks or rubble and are sure to make the job easier and faster. They are narrow enough to fit through a garden gate and can also handle uneven terrain available from 0.5 ton. Perfect for jobs where there may be confined spaces; short in length at just over a meter and 1 ton skip capacity. Features include: 4x4 Drive, Hi Tip, fully hydrostatic brakes. Providing power on demand and capable of dumping into a skip or small truck; Complete with 4x4 wheel drive for off-road work and articulated for maneuverability on tight sites. Available with a swivel skip!